For those who love to travel and escape the last minute too , here's a last minute proposal . 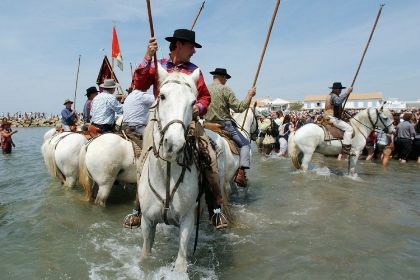 At Saintes Maries de la Mer , in Camargue , one of the most fascinating regions of southern France, on 24 and 25 May will be celebrated Saint Sara , the patron of all Gypsies and Travellers in the world. A feast of bright colors , music, dresses, candles, a tradition of commingling of Provence and Spain , among white horses and bullfights. A ritual that has existed for centuries. The festivities begin with a procession of the statue of the saint, escorted to the sea by the gypsies and the knights of the Camargue riding their white horses . Fulfilled the religious space is given to the festivities , with a strong sense of belonging that summons the nomads from all corners of Europe and beyond. It continues throughout the night , involving all singing and dancing accompanied by guitars and violins that are the background to this holiday season . All this in the beautiful setting of the Camargue, Provence wetland rich in salt , famous for its pristine habitat , where one of the most beautiful spectacles it will be the vision of pink flamingos in the wetlands , in addition to white horses strolling wild among the beautiful lavender fields in bloom.